Browse: Home / What’s Your Gig Rig? What’s your gig rig like? Are you the type who likes to have every possible tonal variation available, or do you just plug your guitar into a killer tube amp and play all night with the same basic sound? I go back and forth on the spectrum quite a bit, but here is a rundown of my typical live rig. I don’t like to use more than one guitar. If I use a different guitar I have to change all the amp settings to accommodate the new axe. I bring one of my telecasters and set the amp accordingly. The exceptions to this rule are if I am playing electric 12 string or lap steel. Those instuments don’t sound like my regular guitar anyway, so I don’t feel the need to fiddle with the amp when I use them. I like the extra instruments but they use up valuable space. I won’t take them if the gig is not worth it, or if I am travelling in a small vehicle with the whole band. I’m a tube amp guy, and again, I will choose my amp based on a number of factors including space and how much power I need. I typically bring my 25 watt Valvetech with one 12” Weber in it, but if there is room I will grab an extension speaker. The extra speaker definitely makes a difference in how well I can hear myself on stage. While I have on occasion played an entire show just with one guitar, one cable, and one amp (I actually think it’s really fun), my typical small rig will also include an overdrive and a delay pedal. If I have to get on and off stage quickly with limited space, I can keep the pedals in my guitar case and just walk in with an amp and a guitar – one trip! My larger rig is still not too huge – I’ll bring the pedalboard along with the guitar (possibly the electric 12 and the lap steel) and the amp (possibly with the extension speaker). The pedalboard is currently rather packed. Compressor, Octavia, Wah, Volume Pedal, Overdrive, Fuzz, Clarinot, POG, Chorus, Phaser, Tremolo, and Delay. I know that’s a lot, but I rarely use them. I like to have them available if I decide I need to sound like a mad scientist. This is the board that accommodates all of my potential sounds. 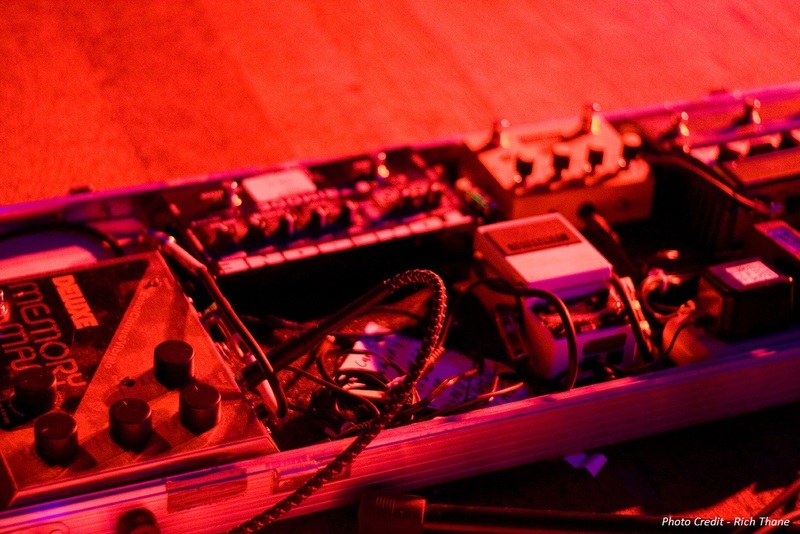 If I am going out on the road I will only bring the pedals necessary for the band I am with. A basic version of my pedalboard would be Volume Pedal, Compressor (or boost), Fuzz (or overdrive), Tremolo, Delay. I use an NYC pedalboard because it is quick and basic. I can walk into a club and be ready to play in five minutes. Generally I try to tailor my rig to the gig – I can use a large rig if the gig is local (I drive myself and don’t share cargo space) and I have time and space to set up. A concert in a nice local venue where the start time is 8:00 is a good example. I downsize if I need to have other people and their gear in my car or if the setup time and space is limited. No one likes a guy who tries to occupy half of the stage in a dive bar with his giant amp, pedalboard, and five extra guitars for a 30 minute opening set, starting at 10:00 PM on a Tuesday.